If you are a graphic designer, part of a design firm, marketer, architect, or just a design enthusiast, we are sure you have heard of Behance. Owned by one of the leading design companies in the world Adobe, Behance is one of the hottest social design platforms. It’s a fantastic platform for anyone who wants to showcase and get inspired by awesome creative work. Behance started in 2005 and has grown to become the biggest community of artists, designers, and creatives. They all come together to get inspired, share their ideas, get feedback from other deign-junkies and stand out professionally. 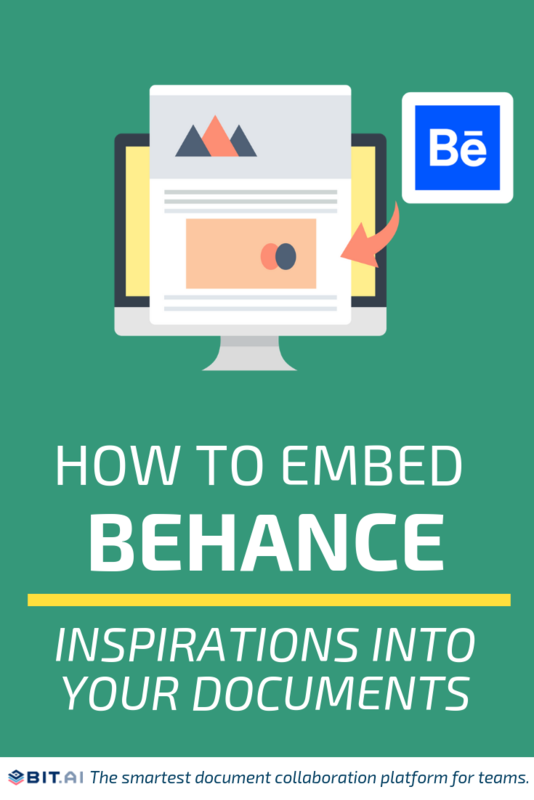 Embed Behance Inspirations Inside Your Bit Documents! 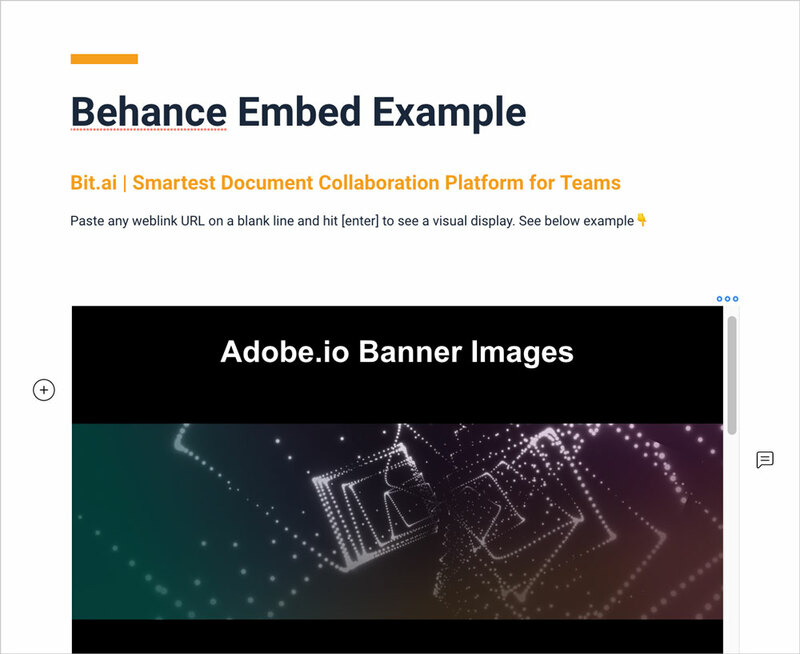 If you and your team use Behance as a source of inspiration as you create, alter, enhance or update your work you’re going to love this smart trick! But before I dive in, let me give you a quick introduction to Bit in case you’re new here! 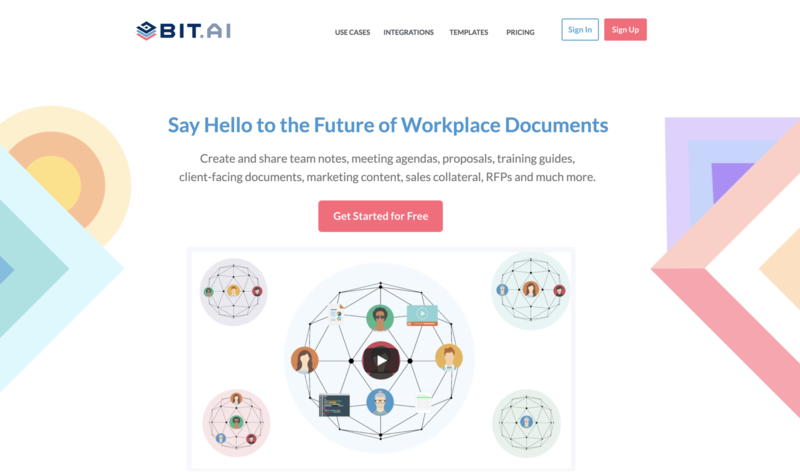 Bit allows teams to create workplace documents like- design projects, design research, project proposals, sales decks, training documents, how-to guides, company policies, process documentation, media kits, fact sheets, competitive research, case studies, e-books, etc. If you want to send these documents to external partners, clients, customers or prospects, you can even track them to get intelligent engagement insights. Just enter any web link on a blank line and hit enter. Bam! The content will show up beautifully. But why embed Behance files in a Bit document in the first place? We often share our designs with our peers over email or chat. Then we try to explain what the design is about in the following email/chat, and before you know it you’re drowning in a sea of questions and answers! When you have your important content scattered around different devices and tools, your productivity always take the backseat. It becomes all too easy to get lost in a sea of browser tabs, and shatter that workflow! Browsing through hundreds of folders, searching in your disorganized and massively populated inbox, searching through your cloud files, notes, etc., all end up being a search mission that’s impossible to crack. Sometimes you want more than just an email to explain what a particular file is about. You need context, information, and text to make your peers and teammates understand what the Behance design that you just shared is all about and what they are supposed to do with it. 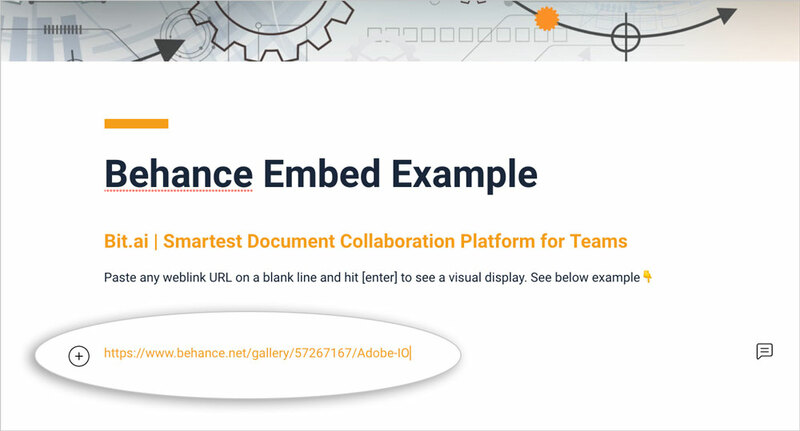 Embedding a Behance design inside a Bit document provides you with that much-needed space to discuss, give suggestions and feedback, and collaborate effectively- without teammates being lost, missing the conversation, and feeling confused. In order to carry out your effective collaboration and communication you need to bring all of your cloud files, data, content, and most importantly, people, under a single virtual roof. Where all your research, documents, spreadsheets, marketing, and sales collateral, internal wikis, knowledge, and digital content can co-exist. Bit’s documents are smart enough to read any weblink and automatically transform that link into visual content. Just enter any link on a blank line and hit enter. Bam! The content will show up beautifully. With Bit, you can copy and paste any Behance weblink on a blank line of a Bit document and hit enter and yep it’ll appear in all its glory! No more dealing with messy iFrame/embed code! 1. Copy the Behance shareable link. 2. Go to Bit.ai and paste the Behance weblink on a blank line and hit enter. 3. Bit will automatically fetch the Behance project and display it like this. Important: Any changes made to this Behance project will be reflected in this Bit document rich embed in real-time. Bit provides a common workplace for knowledge workers and executives to collaborate with employees, share their knowledge, brainstorm ideas, store digital assets, and innovate together. With Bit’s latest integration with Behance, you can easily embed any live Behance files inside your Bit documents! Got a question or need our help? Feel free to send feedback or tweet us at @bit_docs.